I am bringing two pieces of baggage to this show. Firstly a sense that a few London galleries seem to be finding excuses to show the ever popular Preraphs — compare the National Gallery Painters’ Paintings and the V&A’s Botticelli. And also the talk by Karen Shepherdson on Tony Ray-Jones and Martin Parr puts a debate about photography as art and commerce onto my mind. And having just seen William Eggleston at The National Portrait Gallery, my mind was on art. I don’t think that Tony Ray-Jones was a name known to me, but I’m pretty sure I’d seen a photo or two — I’m thinking couple having a picnic at the Glynebourne festival, surrounded by cows. 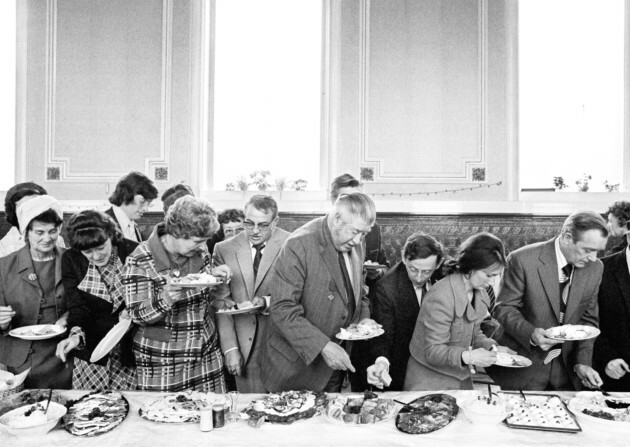 And then Martin Parr curated an exhibition of his photos and his own work, which I think opened the Media Space at the Science Museum I suspect an attempt to ease their presence out of Bradfoford, but that’s another story. That show, Only in England, has toured and I missed it by a day at Liveroool. Now a selection has come to Canterbury’s Beaney, supported by a talk by my comrade Karen Shepherdson. There’s a curious tension in the photos — modernity and nostalgia, realism and the comic, celebration and, maybe, condescension. That last one is arguable. Shepherdson, whose own practice includes working on the harbour at Broadstairs, has enjoyed eavesdropping on the gallery’s viewers, noting their engagement and their memories. Ray-Jones was born in 1941, son of Raymond Jones, a painter and etcher and part of the St Ives school (he had changed his name to Ray-Jones to help his image) who died when the photographer was an infant. After an unhappy time at Christ’s Hospital school in Horsham, he studied at the London College of Printing and won a scholarship to Yale, as spending time at the Design Lab, Manhattan, where he was introduced to street photography. He returned to England with a new aesthetic and credo, partly as an outsider in the era of British pop art and the Mersey sound and Swinging London. Shepherdson pointed out the significance of the seaside to British photography. In the U.K. We are never further than seventy miles from the sea and it became the default destination for the working class day out or holiday. From the early days of photography in the Victorian era, businesses set up on the beach or promenade, taking walker that would be developed and sold to the subject within minutes. Companies had props and backdrops, and portable developing facilities or darkcars. Hundreds of photographs would be taken each day — in the early days ambrotypes and ferrotypes. It became a precious memento of a family jolly, rare in the century before camera phones. The beach is also a carnival space — it is a holiday, even if a day trip, alcohol might have been involved and the family is off duty. Morality … slips. At the same time there is a curious formality — most people would have had work clothes and best clothes, so the beach visitors are often in suit and tie. Whilst Ray-Jones did not only take photographs at the seaside — and had used colour film in America — the beach photos were part of a self conscious project cut short by his death in 1973 from leukaemia. Among his notes are lists of seaside towns — Ramsgate, Margate, Broadstairs, Bridlington and so on — with the one visited ticked off. The south east was more completed than the north east. He toured round England in a dormobile 1966-79 with his wife, seeking to capture an England at risk of becoming Americanised. The seaside towns frequently document nineteenth century resorts in decline — and to my mind offer a sequel to the charabanc trip in Uses of Literacy. In a series of notes to himself, he lists his credo: “Don’t take boring pictures”. He wanted to avoid mid shots in for close ups, to be part of the action. “Be more aggressive.” “Get in closer.” “Not all at eye level.” It seems good advice. Karen showed a picture of people on a boat trip — it gets labelled somewhere like Scarborough but in fact is off Beachy head. A crew member and several passengers are on a pleasure boat, looking in all directions, including a figure you might read as a shepherd in a Yorkshire context. At the centre are a casually dressed young couple, kissing and embracing, he in glasses, she looking like she’s walked off a French new wave film. Je t’Aime. Je t’Aime. They are the only people of their generation in view. The picture was cropped from the original — she is bare footed, a scantily clad woman is off frame. I also notice an older woman in glasses, the only person apparently aware of Ray-Jones at work. Despite Ray-Jones’s injunction to take fewer photos, there were about seventy on the boat. Parr paired Ray-Jones’s pictures with his Nonconformist series, mostly taken around Hebdon Bridge as it made an awkward transition from manufacturing town to a trade based on tourism. He records rituals and routine, again the observation of the every day, with an eye to the absurd. There’s a tableau Shepherdson showed us of a mayoral buffet, a scrum of people at a table, some with filled plates, some yet to reach through, and again a single figure in the background eyeing the photographer. Like Ray-Jones the framing is both perfect and there a sense of people coming in and out of frame, and towards and away from the photographer’s (and our) viewpoint. Parr’s seaside photos – many again in Thanet, perhaps most striking a series at New Brighton in the early days of Thatcherism after he had spent two years in Ireland – are in a garish colour, for me teetering on camp or kitsch, rather like the resorts themselves. There is an honesty and a knowingness – and I recall Parr saying that the beach was a laboratory for his wider photographic practice. Shepherdson notes a sense of estrangement at the heart of both photographers – they make us look again at the every day. At the same time, this risks making the ordinary look alien. In taking these anonymous people and making them into – well, if not art then a quasi-ironised representation (although I’m happy for it to be art, baggage and all) – there’s the risk of being accused of looking down. The photographer here takes his telling image and moves on, having used. Maybe. Shepherdson suggests they refract rather than reflect. But it is up to us to empathise and celebrate and recognise — and as Karen said, perhaps quoting Parr or Ray-Jones, walk like Alice through the looking glass.